The application of movement and gait analysis systems for animals also has a function in preclinical research as here it can help gain new knowledge in areas such as experimental neurology and research into Parkinson’s disease. In most cases, rats or mice are experimented upon to model defects and illnesses of the central nervous system (CNS) which lead to functional deficits. In order to evaluate these deficits, most scoring systems currently depend on unreliable subjectivity, non-linearity, unsatisfactory levels of sensitivity, and limited methods of approach. Zörner et al. (2010) highlighted that extensive quantitative methods are required to enable the evaluation of kinematic animal models suffering from CNS defects. With the application of Simi Motion 2D, a faster, simpler test procedure can be executed, which requires relatively low demands on hardware and time. 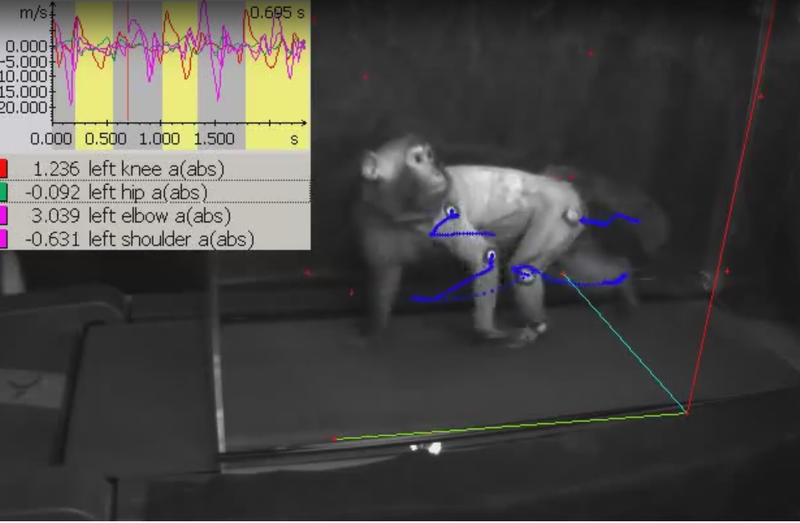 Our software aims to measure joint angles of animals during the execution of motor exercises such as running, climbing, grabbing or swimming. Through the acquisition of kinematic parameter data, it is possible to accurately measure and document the development of motor control and movement behavior. 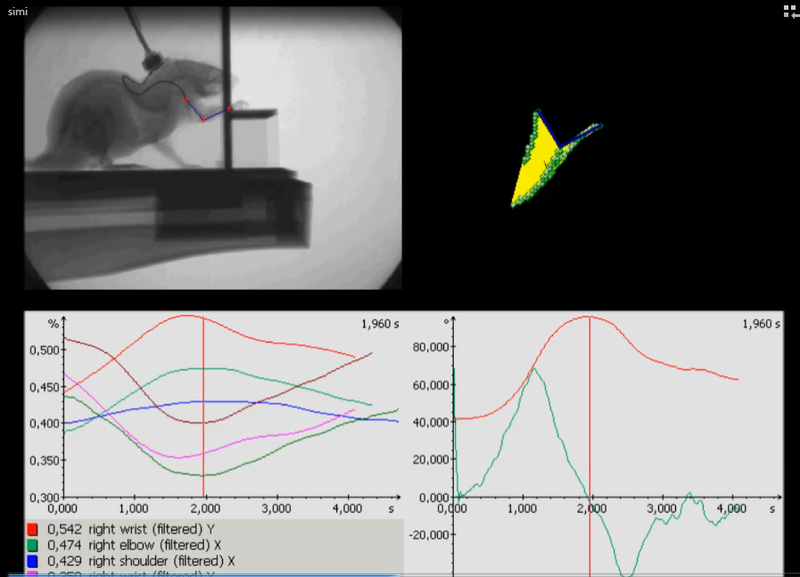 Through the use of just one high-speed camera, animal models can already be devised by recording their kinematics in Simi Motion. The use of several cameras is also possible in a number of different lab setups, for example; a running track, lecture hall, swimming pool or for a grip test. This makes the system applicable to all kinds of kinematic tests, many different lab surroundings. The analysis can be carried out with or without markers, either by tracking electroplated markers or when this is not possible, by pattern-matching. The calculation of joint angles is carried out on the basis of movement data and offers an exact analysis of kinematics and joint angles, as well as further parameters such as step length, velocity, cadence and more. The main aim of Simi Motion 3D is to provide comprehensive data that boasts considerably greater precision than Simi Motion 2D. To conduct analyses, several high-speed cameras are required to collect the appropriate data for the 3D analysis of animal kinematics. The increased precision makes the analysis more exact and therefore much more suitable for scientific investigations. The appeal of the software lies in the range of its abilities, its precision and also in its measurement of rotation parameters. A common consequence of CNS defects, which develop as a result of trauma, ischemia or neurodegenerative and inflammatory illnesses, is a modification in motor control. In the corresponding animal models, the influences must not only be tested for precision and reliability, to evaluate whether a new approach to therapy would be successful, but they must also render the explanation of complex processes such as spontaneous remission of the CNS possible (Basso, 2000; Rainteau et al., 2001). In neurological research, animal models of mice and rats are used frequently, and movement is one of the most commonly evaluated parameters (McEven et al, 2006: Muir, 2000; Metz et al., 2000). (Hamers et al., 2001; Courtine et al., 2009; Magnuson et al., 2009), and electromyography (EMG) (Courtine et al., 2009 ; Gorska,2009). Apparatus which can provide an objective measure of this parameter, therefore becomes necessary, as the most frequently used scoring systems are non-linear, subjective, and lack sensitivity, especially in the detection of compensatory effects.